Attract the right guys while avoiding the "bad guys"
It's great to see such biblically-driven, yet real-world, advice on dating coming from one our very own members here at Fellowship Church. Victorya Michaels Rogers has given single women an invaluable gift within the pages of this insightful book -- it is the gift of finding yourself on the journey to Finding a Man Worth Keeping. Full of practical advice, Finding a Man Worth Keeping will open women's eyes to know what they really want in a husband. Like a helpful girlfriend, Victorya invites you to look at your dating patterns, helps you identify potential pitfalls of Mr. Wrong, and helps you recognize --and be ready for--Mr. Right. This book will help singles make wise choices, and remind you that you are a prize worth keeping So don't settle for anything less than being--and having--God's best. Take Victorya's advice to heart--after all, she found a man worth keeping! As the parents of two single daughters we understand that navigating the dating years is challenging. Finding a man worth keeping can be even more difficult! Victorya Michaels Rogers provides valuable help and humor for women to establish the best patterns and purpose for their dating years that will bring a lifetime of results. This book is a guide you don't want to be without! With confusion and fears swirling around in the heads and hearts of singles today we need more clarity on how to build a healthy and satisfying relationship. We don't need more information, but more practical insights that speak from inside the dynamic of dating. Whether verbalized or not, every single is looking for some tested and proven insights that might come close to guaranteeing success in a relationship. Single women are many times left on their own to figure it all out by trial and error. What they need is a wise counselor who has been there-done that! Victorya, having been in the single arena for several years before finding a man worth keeping, has become that counselor to women. Her insights into what each person is thinking is remarkable and her perspective on the differences between men and women is most helpful. Ladies, find this book and you will go a long way toward Finding a Man Worth Keeping . How does today's dating scene leave you? Anxious? Frustrated? Confused? Then Finding a Man Worth Keeping by Victorya Michaels Rogers is a wise investment. Her 10 dating secrets are scriptural, practical and fun, but carry that all important "Honey, I've been there" encouragement. And single moms, the special bonus chapter is worth the price alone. -- Sandra P. Aldrich , international speaker, author of several books including From One Single Mother to Another. "Victorya's passion for single women is so beautifully seen on every page that I just couldn't put the book down - and I've been married for 21 years! It's wise, simple and powerful and I know it will change many lives and be the source of many solid Christian marriages to come. Great job Victorya! "Any good men left out there?" women ask whenever I speak to divorce groups. Finding A Man Worth Keeping offers thought-provoking insight, credible advice, and practical tips not only for singles but for those thrust back into the hazy-crazy world of dating who long to trust again but question their instincts. -- Kari West, author of When He Leaves: Help and Hope for Hurting Wives (Harvest House); conference speaker, and founder of Take Hope To Heart Ministries TM . "Wow, this is a must read. I wish every one of my clients would read this book--Christian or not. Perhaps then they would make better relationship decisions in their life." Next to the Bible I can't think of a more important book for single women of all ages to have on their bookshelves. Finding a Man Worth Keeping is filled with ten practical dating secrets that prepare women to recognize God's choice of a husband when he comes into their lives. Packed with easy-to-read, engaging stories, Victorya Michaels Rogers has put together a must-read for all single women including a bonus section for single moms. If you are dating, have a daughter or a friend who is dating, or are involved in youth or single adult ministries, then you need to read this book and pass along the tips to others. Three cheers for Victorya! If you're still dreaming of moving from hugs to kisses and lifetime commitment, Finding A Man Worth Keeping is worth it's weight in diamonds! And while you're waiting, Victorya's secrets in this interactive treasure are sure to help you become a woman worth keeping. "I would highly recommend this book to any single woman who desires to be married. Victorya brings to light many important points that women need to address before they meet someone, along with providing tools to have a succesful relationship after meeting a man. Victorya is a gifted and highly credible author. I think her book is a must for anyone dating." "This book is an inspiration and serves as a type of grid to lay over your dating life. She uses a very unique and insightful way of writing that draws us to it in a way that it can relate to most all women." "Dating is most always a very confusing and stressful time in a girls life, especially with different views form every influence around you. I believe Victorya's views on many aspects of dating are helpful, covering the physical, emotional and spiritual desires and longings of a heart for the 'right man.' She gives helpful tips and is an inspiration for a right and God-centered dating life"
"This is a cool book. It's fun because she lets the reader interact with the book. And this is something that applies to everyone. I like it." "Victorya Michaels Rogers shares her heart and embraces you as a girlfriend, as she seeks to encourage girls of all ages on life's journey through dating relationships. She provides practical beauty tips as well as stressing the importance of inward beauty and character. As I listened to Victorya's heart of experience, I found myself smiling in understanding, challenged to more readily define my standards for a future husband, and comforted in the reassurance of God's perfect timing and His amazing plan for my life." "I could definitely identify with Victorya because we all dream of getting married and living happily ever after! 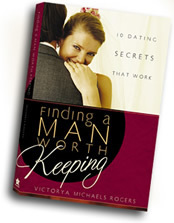 This book gives practical and uncomplicated advice to find a 'man worth keeping'." "It was really good. I think I liked it because it isn't as "Christiany" as most Christian books. I mean, most "Christianity" books are BORING." "A must read for all single women, especially those struggling with their singleness. Victorya offers encouragement to keep seeking God's best and not settling for anything less. Plus, she forces you to take a good, hard look at the men you're attracting and even goes into areas often untouched by Christian authors, such as plastic surgery and whether it is an option." "I have been so frustrated with the dating scene that I have wanted to give up. 10 Dating Secrets has rejuvenated me and helped me realize that it is up to me to find the man of my dreams. It's nice to know there is hope after 30 and that I have to stop waiting for Mr. Right to "miraculously appear on (my) doorstep". The exercises in Chapter 1 were a real eye opener into my dating history and what I want in my dating future. Chapter 3 was a good reminder to always look your best, especially for a girl who is about to give up on men." " 10 Dating Secrets is a lighthearted fun look at the often treacherous world of dating. I felt inspired and focused--my face renewed. I can't wait to begin my journal and work toward my own Cinderella story." "This book is very delightful. With Christlike beliefs, Victorya has well expressed her experience. I would suggest that you re-read it. In my opinion, the first and second times will be good investments for every reader."